(Nanowerk News) What about putting your logo on LED lamp to project the picture on the wall? Or do you want your money to shine in different nano-colours depending on the value? 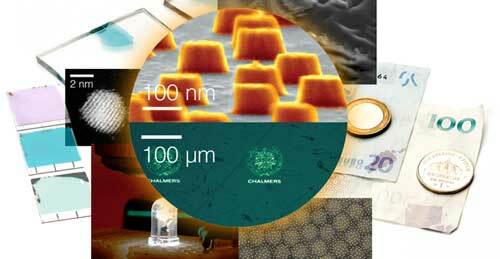 With a new method from Chalmers and The University of Gothenburg this is possible. The new technique allows you to put, in practice, any nano-, micro-, or macro pattern on any surface or object. The new technique allows you to put any nano-, micro-, or macro pattern on any surface or object. "It works in a rather simple procedure that does not even require a complicated clean-room-type processing", says Alexandre Dmitriev, associate professor at the Department of Physics at the University of Gothenburg. Right now he is a visiting associate professor at Stanford University, but the method is developed by him and his group in Gothenburg together with professor Eva Olsson and her group at the Department of Physics at Chalmers. "The new idea of transferring the patterns is a result of a joint brainstorming meeting between us where we represent different disciplines in research - advanced microscopy and material structuring", says Eva Olsson. The results have been published in Scientific Reports ("Multiscale conformal pattern transfer") earlier this year and now the researchers hope that colleagues around the world will pick up the new technique, as potential applications are really broad. "We would like to share the knowledge as much as possible so people understand the process and might start using it in their labs. It’s easy to implement and there is a detailed picture guide how to do it in the article", says Alexander Dmitriev.